I attended your session at the AADE conference and thoroughly enjoyed your presentation.† However I couldn’t write fast enough to get good notes.† I met with you briefly after the session was over and you stated that if you could, you would send me the Power Point file so that I could have the info I need. I’m a RN diabetes educator and often need Spanish materials. Thank you so much! I attended your talk on the Hispanic Food Market at the AADE. Your talk was excellent and I would like to use your slides as a resource, particularly the ones where you list the typical food, and then give substitutions. I would like to thank you for inviting Ms.Drago to speak to us today. She was an excellent source of information and the meeting was most enjoyable. I hope she will be able to return in the future. T.A. Thanks for the fantastic, engaging workshop. As I said to the group, it was the best workshop I have attended in the 15 years I have had diabetes. I enjoyed your presentation at the Amarillo Conference. You should have had 1 hour! I have been a diabetic for 10 years and going to a Endocrinology’s for 8. No one has ever talked to me about diet. I had checked the net for the information. It was a great conference and I hope we have another one soon. I attended the TCOYD conference in Amarillo, TX recently. My wife and I think yours was the most informative and useful information. We appreciate all that you do to help diabetics. My wife is the one in our family with diabetes and now our younger son is developing the symptoms. We have my wife pretty well controlled with Lantus. It took some time to figure the correct amount to get control. I purchased these portion cups and flash cards at FNCE and they have already been useful! P.S. I have no connection to Lorena’s business in any way. l just felt compelled to vouch for these two very nice, good quality, affordable products that fill a gap in our ability to educate Hispanic clients with diabetes in a culturally competent manner. The book is filled with helpful lists and tables of common foods eaten in the regions, utensils used in a Latin kitchen, and practical list of what to do during holidays and special occasions. 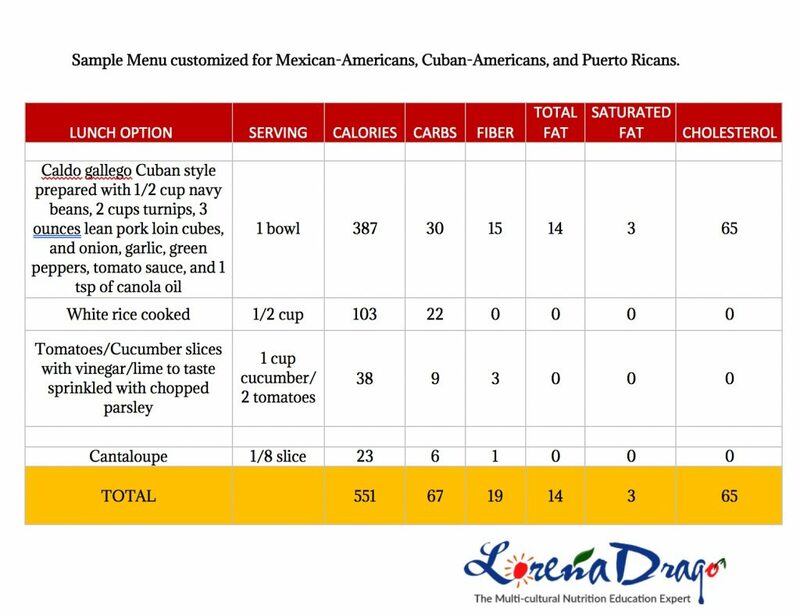 Here are food lists, exchange lists and sample meal plans geared to Latino culture and foods, offering shopping lists, health insights, and the basics. From how to read a nutrition label to balancing a meal, this isn’t your usual recipe book – plenty of those elsewhere – but a fine diabetes management guide especially valuable to non-English speakers with different ethnic foods on board. I love the layout of this book! It’s written in English — but flip it over, and it’s in Spanish, too. Do you think that rice and beans don’t fit into a healthy diet? Wrong. High in protein, fiber and iron, beans are a nearly “perfect food”, in the right portion size, of course. The book’s question and answer format is highly readable, and includes complete foods lists, exchange lists, sample meal plans, and more.